Isn’t this vintage drawing fun? 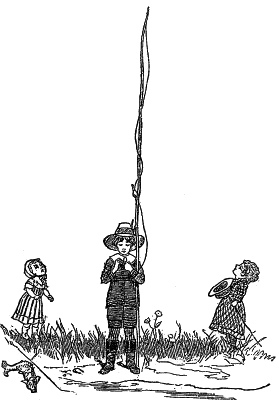 It was included with a sweet little poem in the May 10, 1881, edition of Harper’s Young People. A little boy with a giant fishing pole is standing at the water’s edge with two little girls awe-struck by the size of the fishing pole. A fish swims nearby, perhaps mocking the young boy that he won’t be able to catch him, even with the world’s longest fishing pole. The drawing has fairly simple lines and is in black and white. I think it would make a great picture to use on a scrapbook page of kids on vacation or kids fishing for the first time.